Parents will ensure that the worksheets given for homework are completed by child and signed in the handbook before sending them to school. The worksheets for a term will be returned to the child at the end of each term during the parent – teacher conference. In studying English, children develop skills in speaking, listening, reading and writing. This enables them to express themselves creatively and imaginatively, and helps them to communicate with others effectively. Great emphasis is placed on developing children's spoken language, as this is crucial for learning to read, write, to be numerate and successful in all areas of learning.This is the reason why we have news paper reading sessions and a exclusive worksheet designed in the name WORDART to improve the child’s writing habits and grammar skills. Mathematics equips children with a uniquely powerful set of tools to understand and change the world. Children are involved in a broad range of activities in order to learn mathematical concepts and develop numeracy. 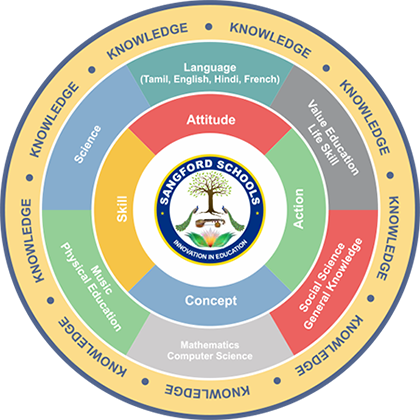 They are given practical experience using the worksheets exclusively designed at Sangford ,various learning aid materials, investigative tasks, regular practice and analysis of mathematical facts and procedures to develop math skills. History fires children’s curiosity about the past in Britain and the wider world and hence go about teaching them by framing In studying history, children consider how the past influences the present, what past societies were like, and what beliefs and cultures influenced people’s actions. In Geography, children develop knowledge of places and environments throughout the world, an understanding of maps, and a range of investigative and problem-solving skills. Science stimulates and excites children’s curiosity about phenomena and events in the world around them. It links direct practical experience with ideas, and therefore engages children's interest at many levels. Children are taught to discriminate, classify, recognize relationships and select information from a variety of sources. They develop skills in hypothesising, testing and evaluating ideas, and communicating using scientific language, drawings, charts and tables. Learning becomes successful when the learnt information reaches to the students permanent memory from their temporary memory. This is achieved at Sangford , as we focus on whole brain development . Our curriculum possess five essential elements : concepts , knowledge ,skills , Attitude and action which helps the children's development in areas such as cognitive , socio-emotional, physical ,linguistic and creative skills. We use learning aid in our teaching concept which make the students to understand more lively and briefly. More over this technique initiates students mind. We make sure apart from regular classes we include Life skills , seminars ,public speaking skills, spoken English and many more as our intention is to bring knowledgeable, responsible and engaged citizens of the community , country and the world. Researches prove that early education(between 3 to 5 years) pave a right way to the children when they become adults. For this reason we follow special methodologies and techniques. We go up with Montessori Method, however we have age appropriate worksheets which is approved educationalist. Apart from regular classes we go up with activities like Show and Tell , Sensory activities, Dramatic Play , Thematic play, Art & craft, Rhymes and many more. As far as Kindergarten concern we work with each kids individually as they need more attention from teachers. Sangford Library is a bigger one where nearly 80 children's can be accommodated at a time. We believe that no one can be a better companion other than books ,so we inculcate reading from their kindergarten. We also buy magazines and newspapers are given to improve LSRW. Sangford Schools™ Children’s library is housing with age appropriate book materials and children’s CD-ROM, original Learning-Reading-Listening-Activity software, audio, video and DVDs are from USA. Moreover story times, themes which gives more attraction towards books. Books are an excellent way to learn about new or unfamiliar situations. We strongly recommend reading books for kids on a regular basis which gives them a dramatic reading habits, and lead them in School, by encouraging children to give their own answers to questions rather than memorizing them during examinations. Scientists who study the brain have found out a great deal about how we learn. They have discovered that babies learn much more from sights and sounds around them than we thought previously. You can help your child by taking advantage of his/her hunger to learn. Read regularly children age appropriate books to your child to create the habit of learning. Our library is well stocked with books suitable for children different age groups. So it’s easy to find the right books for your child. As our world becoming digital it's essential that children's too to be updated with that technologies. We have all modern and updated methodologies in our campus. So, to ensure that we have smart class rooms and highly digitalized and updated systems. Since we focus on practical teaching our Physics, Chemistry, Biology, Maths and Computer labs are more equipped and modernized. Our curriculum has got Robotics for which we do have a lab. We conduct competitive exams to keep them updated like IMO,NSO,IEO. To create awareness among children's about various celebrations, we celebrate events in our campus despite of caste and religion they belong. We also do relevant crafts to make the event memorable. We take them to educational tours and other local areas like visiting organic farming, etc. to creates an awareness as well as they link with the subjects. We do social awareness programmes like giving trees to public , incorporated a walkathon against Plastics, collecting money from public for cancer institute Adyar. The School has a spacious area of around 3 acres and also the class room designed in such a way that it’s aerated. Classrooms are colorful with pictures and smart board facility. Classrooms are equipped with cutting edge facility. Our washrooms as well our campus are clean in rotation and is been monitored by a separate team of members. We have sufficient number of fire extinguishers for safety. Transport routes are monthly monitored so as to inspect the routes also safety measurements are available in our van. Parents involvement is very essential of a successful development of a child. So, as to impart this we conduct regular parenting class annually in which discuss about children's emotional, social and physical development through the discussion with parent educator. Parents Teacher Meeting is a regular affair after every term where both parents and teachers discuss about the child academically and physically. Apart from this our teachers have a friendly relationship with parent by telling their child improvement. We send Home work messages , so that parents will know the happening at school and We also update event photos in our facebook . We send class room activity photos through whatsapp. We always higher a well qualified, skilled and a professional teacher, as our value and mission can be reached through them. We never compromise in hiring a right teacher. We conduct regular training sessions to keep them updated. All teachers ensure that their is teaching is interactive and innovative. Teachers also ensure the participation of all the children in the class.